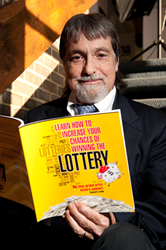 Learn How to Increase Your Chances of Winning The Lottery with Mark Sonder Productions, Inc.
7 Time Lottery Game Grand Prize Winner Speaks, Presented by the Award Winning Entertainment Agency Mark Sonder Productions, Inc. Thank you Mark Sonder Productions and Richard Lustig for giving me the tools required to win the lottery! Mark Sonder, MM, CSEP and President of Mark Sonder Productions, Inc., the award winning national entertainment producer for large events is proud to announce that his company represents Mr. Richard Lustig, the 7-Time Lottery Game Grand Prize Winner and speaker for corporate, association, casino, and events on the topic of How to Increase Your Chances of Winning The Lottery. TLC's "How The Lottery Changed My Life"
He is also in Ripley's Believe It or Not. He has made 23 visits to the lottery offices to cash in winning tickets too large for local merchants to pay out. This week's jackpot is expected to be in the millions. Do you play the lottery? Would it benefit your group to have Mark Sonder Productions provide you with Richard Lustig to present to your group to better prepare to win? If so, please contact Mark Sonder, agent for Mr. Lustig at 540-636-1640.